About 360 kilometres from downtown Halifax, on the west coast of Cape Breton Island, lies the tiny community of Dunvegan. Too small to be a town, Dunvegan is a fork in the road located between Inverness and Margaree Harbour. It was here, in a small, hand-built shed overlooking the Atlantic Ocean (with Prince Edward Island in the distance) that writer Alistair MacLeod spent his summer vacations. It was in this shed that he wrote some of the greatest short stories in the English language and his one and only novel No Great Mischief. Like many “Capers” before him, MacLeod spent his youth working as a miner and a logger. He used his income to pay for his education, earning both his undergraduate degree and teaching degree from St. Francis Xavier University in Antigonish, Nova Scotia. MacLeod spent his career as an English and creative writing professor at the University of Windsor in Ontario. Between the demands of being a full-time professor and a father to six children, he found it challenging to find time for his writing during the school year. However, during his summer vacations, he and his family returned to the family home in Dunvegan (named for Dun Bheagan on the Isle of Skye in Scotland) where he had the opportunity to focus on his writing. MacLeod’s work examines the daily struggles of the people of Cape Breton Island. What gives MacLeod’s writing its power and its majesty is its lyricism: MacLeod often read his work out loud as a way to perfect the cadence of each line. He was a slow and methodical writer, carefully considering every word. Although he produced a very small body of work in his lifetime, the quality of that work is outstanding. 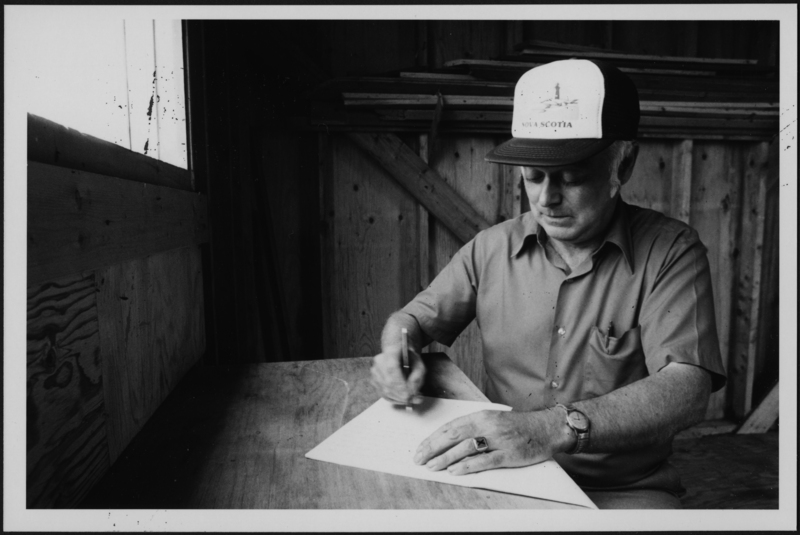 Library and Archives Canada (LAC) is lucky to be the repository for the Alistair MacLeod fonds. In the early 2000s, LAC acquired about 4.5 metres of material (both textual and graphic) created by MacLeod in Ontario and in Nova Scotia. The material spans his career as both a writer and a teacher. The fonds includes manuscripts, correspondence, essays, thesis notes, clippings, photos of MacLeod and more. 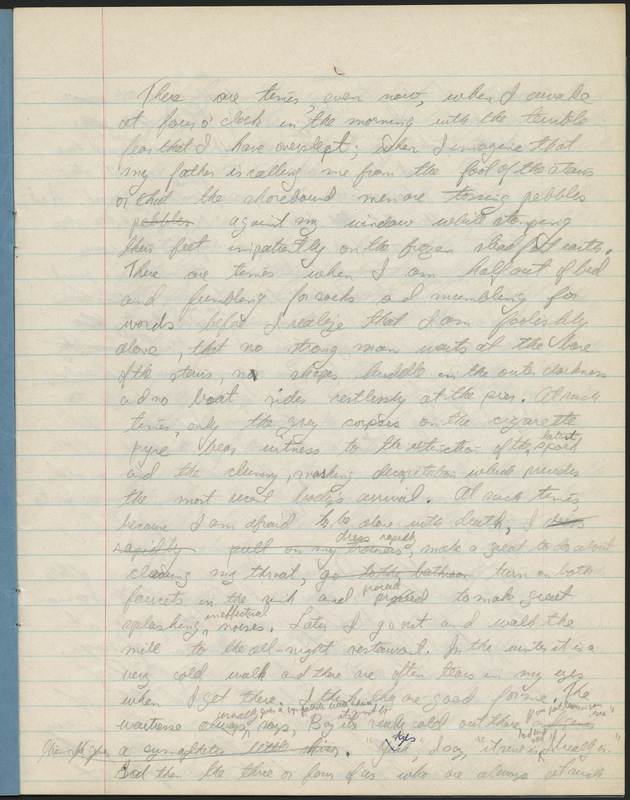 Looking at MacLeod’s original manuscripts gives us a fascinating glimpse into his process as a writer. He was known in the Canadian literary community as a perfectionist, and you can see this is true in his manuscripts. The first draft of his short story The Boat is handwritten in an examination booklet from Notre Dame University (where MacLeod earned his PhD). If we look at the published version of the first paragraph of that story—perhaps one of the most beautiful paragraphs in English literature—it is nearly identical to the author’s draft version. MacLeod continued the practice of handwriting his work throughout his career (a practice perhaps perceived by many writers today as very old fashioned!) He also wrote part of his manuscript for his novel No Great Mischief by hand. It is quite a special thing to see a work of this calibre written in long hand rather than as typewritten words on a page that we are so used to seeing nowadays. It gives you a very personal sense of MacLeod working diligently away during his few precious hours of free time, overlooking the beautiful cliffs of Cape Breton and the sea below. This entry was posted in Literature and tagged Alistair McLeod, Canadian literature, Canadian writer, Cape Breton, Nova Scotia, writers by Library and Archives Canada Blog. Bookmark the permalink.